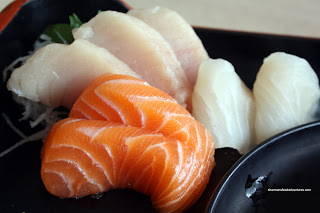 Just like my recent post on Wing Yuen, Japolo Sushi has an interesting mix of ethnic cuisines. Of course, we can derive from the name that one of them is Japanese. The other? Vietnamese. The story behind this is that the owner-operator is Vietnamese. And it's not a stretch for practically anybody to open a Japanese restaurant these days. The only issue would be whether it actually is good or not. Yah, that might anger the "authenticity police"; but honestly, if the food tastes good, it really doesn't matter. I've always wondered about this place having driven by it numerous times. Finally, we decided to try it out after a featured article appeared in the Burnaby Now. What caught my eye was the Sushi Burger. Sushi Burger??? Yup, that's what I thought too. Apparently, the owner is not afraid of taking chances and creating his own twist on sushi. Authentic? Probably not. However, the whole point of cooking is to push the envelope while producing creative and original food. To satisfy my curiosities, I went for some Japanese food and... a bowl of Pho Dac Biet too! Hey, it is a Japanese and Vietnamese restaurant after all... Once again, I got the everything Pho consisting of rare beef, flank, brisket, tripe and tendon. You know what? The Pho was pretty good. A bit odd in a restaurant that is mostly decked out in a predominantly Japanese theme. I thought the broth was on the saltier side lacking a bit of depth. However, the perfect noodles and decent amount of meat made for a good Pho. In order to try out as many items as possible, we got a Lunch Box C to share as well. For only $9.95, we thought the box was a good value considering that it included Miso Soup, Sunomono, Tempura, Yakisoba, 7 pieces of Sashimi (Tuna, Salmon & Tai), 3 pieces of Nigiri (Tuna, Salmon & Ebi) and half a Tuna Maki. We found the Sashimi to be decent with the tuna being on the mushier side. The Salmon and Tai had a fresh look and taste while having a good texture. The Nigiri and Tuna Maki were acceptable with sushi rice that was slightly gummy. Despite a tad too much batter, the Tempura was still crispy and none too oily. The veggies and ebi were cooked properly. 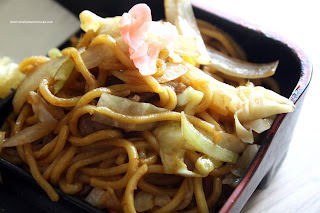 The Yakisoba was slightly disappointing since the noodles were overcooked and mushy. Taste-wise, it was alright, with just the right amount of seasoning. Don't let the picture fool you, it was actually quite a big portion. 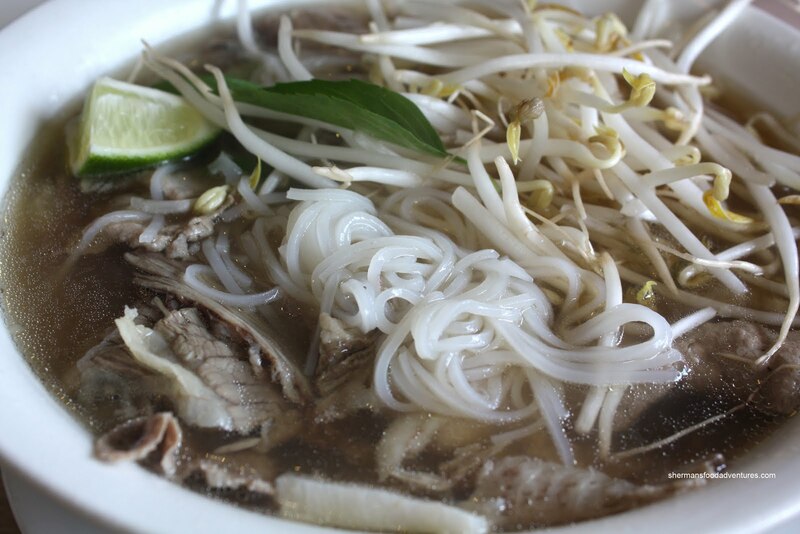 Of course, we didn't come here to just have Pho and a lunch box. We were here for the Sushi Burger. Up to this point, I was snapping photos and no one had even cared. But when I started taking pictures of the sushi burger, the server politely asked me to stop. I'm guessing that they did not want anyone to copy their signature item. Since it was practically the end of the meal, I was comfortable with giving them one of my Moo cards. After that, they let me snap away. And about that burger... 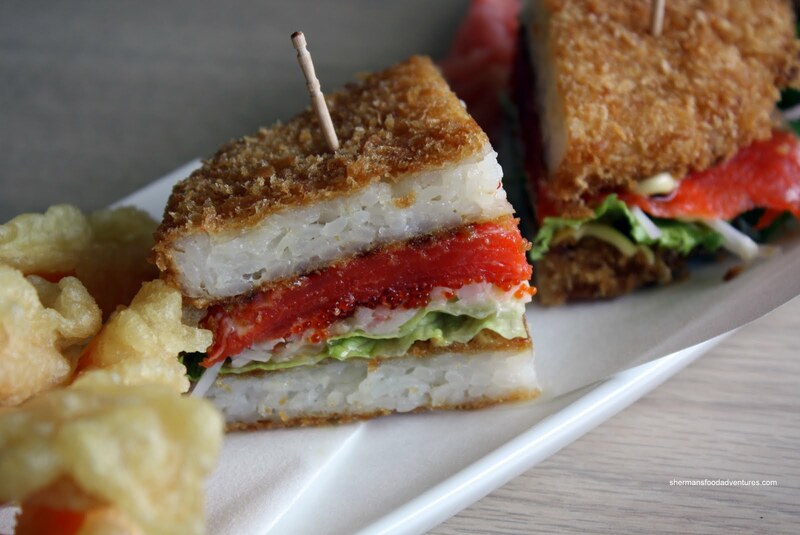 It is essentially imitation crab, lettuce, smoked salmon, tobiko, mayo and unagi sauce sandwiched in between 2 fried panko coated pressed sushi patties. Originally, I was concerned that the smoked salmon would overwhelm the entire thing. In actuality, it provided the necessary flavour since everything else is quite mild. I was also concerned about the fried pressed sushi rice; but once again, it was a perfect "bun". It stayed nicely together, wasn't too dense or oily. Furthermore, it was a good contrast of crispy and soft. 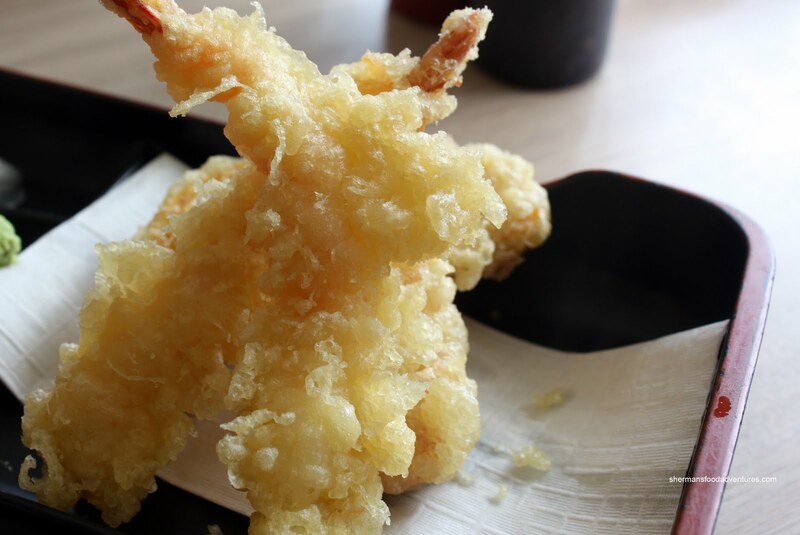 It was served with tempura yam fries, which could've used less batter. Wait. We were not finished yet! We also ordered a Platinum Roll, which is their take on Aburi Sushi. Salmon, imitation crab, cucumber, avocado and tobiko made up the inside while the outside consisted of snapper glazed with mayo, unagi sauce and toasted sesame seeds. 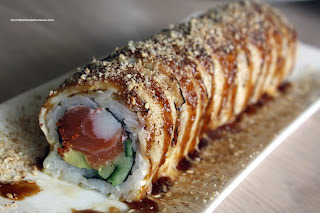 The outside of the roll was then torched, which in theory, caramelizes the sauce. 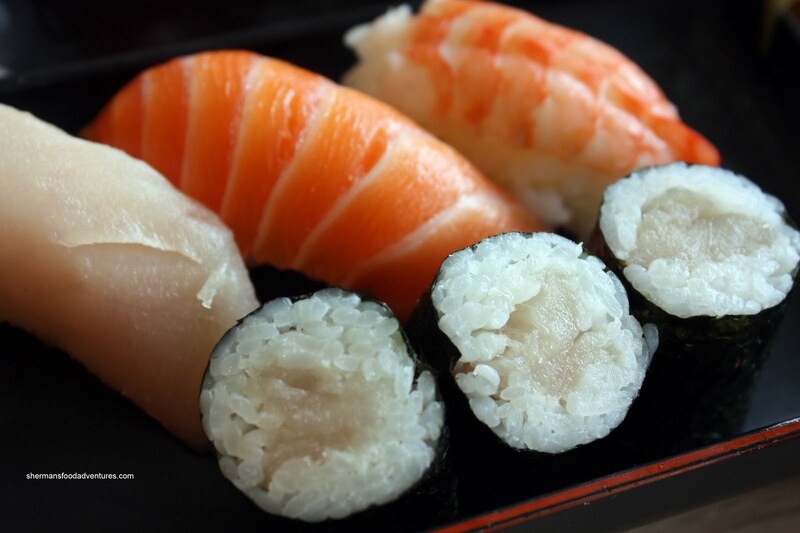 One concern about this type of sushi is the that the sauce becomes the predominant flavour. In this case, that didn't happen since there was ample amount of filling and the sauce itself was not overly powerful. The modest amount of creamy mayo was just enough to provide an interesting texture to a pretty standard sushi roll. I know that the large signage outside advertising Pho and Sushi may scare off some people. However, the food that I had was on the better side of decent. The Pho was solid and the Japanese food was more than acceptable. Sure, it wasn't perfect; but for the reasonable prices they charge, combined with the generous portions, it is safe choice. Even if the combination of 2 cuisines is confusing. 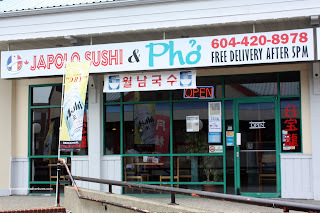 - You can get Pho and Sushi at the same place! When you mentioned originally about "sushi burger", I thought something on the lines of MOS burger, which is what a small Japanese restaurant in Broadway, near Cambie, is trying to do. LOL Kim, no I didn't have Chicken Party. Now I think I should! Yah, the sushi burger was pretty good! In fact, I was surprised at the meal as a whole. Food was solid. Do not try the terriyaki chicken rice burger at the Richmond night market. It is gimmicky but light bread buns are much better for sandwiches not dense disks of dryish rice. I've never in my life not liked rice before trying that sumo burger. It was too hard to eat we ended up eating the chicken part and throwing the rice part out. A chicken terriyaki sushi roll would be much better. However I do want to try the version of the sushi burger served here. They are Chinese people i think. When i went there the servers spoke in Cantonese. I could be wrong. I know that our server was Chinese and I think the wife is Chinese; but I think I read somewhere the husband is Vietnamese. If you liked their sushi burger, you have to go back and try their sushi pizza, it's my favourite thing on their menu. I tend to get one of the salmon ones.